Supervisors are encouraged to initiate the FFT1/ICT5 taskbook for students prior to attending this class in accordance PMS 310-1 Wildland Fire Qualification System Guide and agency policy. We are pleased to supplement the NWCG course content with Introduction to Fire Signature Predictions, based upon the work of Doug Campbell. See www.dougsfire.com for more information about CPS. A FFT1/ICT5 position taskbook can be initiated by our training specialist with authorization from the student's fire department or home unit. The following information is from the PMS 310-1 “Wildland Fire Qualification System Guide” - May, 2008 version. 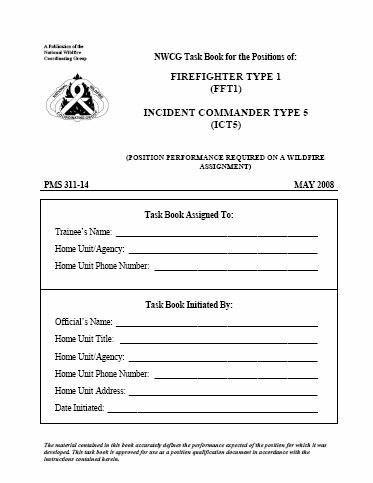 Note: the Firefighter Type 1 (FFT1) and Incident Commander Type 5 (ICT5) Position Task Books have been combined. However, the positions have not been combined. The FFT1 tasks are completed only once; additional tasks must be completed to meet the ICT5 level. The FFT1 and ICT5 tasks can be completed simultaneously. The Required Experience is satisfactory performance as a Firefighter Type 2 (FFT2). Successful position performance as an Incident Commander Type 5 (ICT5) on a wildfire incident.